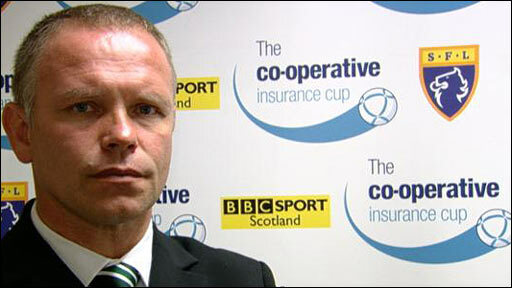 St Johnstone came from behind to knock Hibernian out of the Co-operative Insurance Cup at the third round stage. 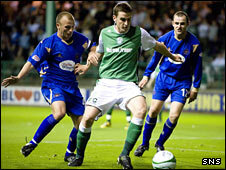 Hibs took the lead within the first minute when Anthony Stokes swept a rebound shot past keeper Alan Main. But Gavin Swankie's drive quickly levelled matters before Derek Riordan missed a penalty for the home side. Substitute Christopher Millar put Saints ahead in the 76th minute and Jody Morris' half-volley made sure of victory nine minutes from the end. Having defeated St Johnstone 3-0 in Saturday's Scottish Premier League fixture, Hibs set about recording a similar scoreline straight from the kick-off. Stokes, who grabbed a brace at the weekend, reacted quickly to steer his shot into the net after Darren McCormack's first attempt was blocked by Main. Saints' response was almost immediate as Swankie received the ball at the back post and finished well past Stack. Minutes later, Swankie tested Stack with a free-kick effort after Ian Murray had been penalised for handball. Stack denied Murray Davidson before a skilful run and shot by Steven Milne was also blocked by the Hibs keeper. Liam Miller won a spot-kick in the 32nd minute after being fouled by Graham Gartland but Main was equal to Riordan's attempt from 12 yards. Deuchar drew a save from Stack early in the second half before Main comfortably gathered an effort by Stokes. Stokes then crossed into a dangerous area and Davidson was prevented from scoring an own goal by Jody Morris' clearance. And from the resulting corner, Hibs were again denied by a goal-line clearance, with Murray foiled by MacKay. Riordan was unsuccessful with a shot from the edge of the box and within seconds Davidson came close at the other end. Main saved well from Stokes, who was then denied by a last-ditch tackle by Danny Grainger. Millar replaced Liam Craig for the visitors and quickly made his mark on the match by giving St Johnstone the lead for the first time. The midfielder received fellow substitute Filipe Morais' pass deep inside the penalty area and rolled the ball into the net. And Morris put Saints further ahead with a powerful 20-yard shot after Stuart McCaffrey's header had been cleared off the line by Paul Hanlon. 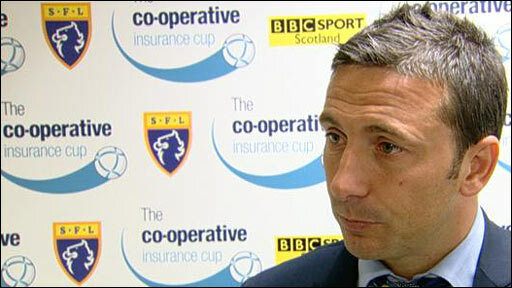 "I felt St Johnstone deserved their victory. Their attitude and application was slightly better than ours. "In saying that, we got off to a right good start. We didn't hold onto it long enough, which was disappointing. "They're a good side, they play some good football. They thoroughly deserved their victory tonight, that's the disappointing thing. "We were trying hard enough, it just didn't go for us tonight. Certainly in the fundamental side of the game, we were second best. We lost bad goals." "It was nice to progress in the cup, we know what a good cup run can bring to the club. "I thought we got our just rewards tonight. I think there was a quiet determination about them tonight that they wanted to rectify Saturday's result. "We got rocked by losing the goal early and it was a real test for the players. But they responded and scored a good goal through Gavin Swankie. "We took more of our chances tonight and it was a great finish from Chris Millar. The third goal from Jody Morris was a magnificent strike, technically brilliant. "It was a good team performance. Individually, we won a lot of battles out there and that was important. "We're in the quarter-finals, hopefully we can win our next one if the draw's kind to us and who knows where it will take us? Certainly, if we produce that type of performance, we're capable of beating most teams." 90:00+3:15 The final whistle goes and the game is over. 90:00+1:02 Indirect free kick taken by Alan Main. 90:00+1:02 Booking Anthony Stokes is cautioned. 90:00+0:52 Graham Gartland fouled by Anthony Stokes, the ref awards a free kick. 87:48 The referee blows for offside. Free kick taken by Ian Murray. 85:44 Derek Riordan is flagged offside by the assistant referee. Alan Main takes the free kick. 83:22 Free kick awarded for a foul by Kenny Deuchar on Paul Hanlon. Free kick taken by Ian Murray. 81:45 GOAL - Jody Morris:Hibernian 1 - 3 St Johnstone Jody Morris finds the net with a goal from the edge of the penalty box to the top right corner of the goal. Hibernian 1-3 St Johnstone. 81:01 Effort from the edge of the area by Filipe Morais goes wide of the right-hand post. Inswinging corner taken right-footed by Filipe Morais from the right by-line, Murray Davidson takes a shot. Save by Graham Stack. 79:38 Daniel Grainger takes the indirect free kick. 79:38 Substitution Stuart McCaffrey on for Steven Anderson. 79:38 Foul by Kevin McBride on Murray Davidson, free kick awarded. 78:41 The assistant referee signals for offside against Anthony Stokes. David MacKay takes the free kick. 77:10 Derek Riordan sends in a cross, Headed effort from inside the area by Paul Hanlon misses to the right of the goal. 76:54 Derek Riordan decides to take a short corner. 75:32 Assist by Steven Milne. 75:32 GOAL - Chris Millar:Hibernian 1 - 2 St Johnstone Chris Millar gets on the score sheet with a goal from deep inside the penalty box to the bottom left corner of the goal. Hibernian 1-2 St Johnstone. 75:12 Booking The referee cautions Kevin McBride for unsporting behaviour. 73:03 Inswinging corner taken by Merouane Zemmama from the right by-line, Liam Miller takes the chance to get an effort at goal. Alan Main makes a comfortable save. 71:56 Danny Galbraith takes the free kick. 71:56 Substitution Chris Millar is brought on as a substitute for Liam Craig. 71:56 Booking David MacKay is cautioned by the ref for unsporting behaviour. 71:50 David MacKay concedes a free kick for a foul on Danny Galbraith. 70:25 Outswinging corner taken right-footed by Merouane Zemmama, Derek Riordan takes a shot. Blocked by Filipe Morais. Corner taken by Derek Riordan played to the near post, Liam Craig makes a clearance. 70:02 Derek Riordan fouled by Jody Morris, the ref awards a free kick. Free kick crossed right-footed by Derek Riordan from left wing, David MacKay manages to make a clearance. 69:28 Short corner taken by Derek Riordan. 69:18 Anthony Stokes takes a shot. Blocked by Daniel Grainger. 68:09 Substitution (Hibernian) makes a substitution, with Danny Galbraith coming on for John Rankin. 66:51 Murray Davidson takes a shot. Save by Graham Stack. 66:12 Derek Riordan takes a shot. Comfortable save by Alan Main. 63:56 Corner taken left-footed by John Rankin, Ian Murray takes a shot. David MacKay gets a block in. 63:05 Free kick awarded for a foul by John Rankin on Filipe Morais. Indirect free kick taken by Steven Anderson. 61:10 Corner taken by Filipe Morais, Kevin McBride makes a clearance. 60:19 Alan Main takes the free kick. 60:19 Substitution Filipe Morais joins the action as a substitute, replacing Gavin Swankie. 60:19 Anthony Stokes gives away a free kick for an unfair challenge on Graham Gartland. 57:33 Substitution Merouane Zemmama comes on in place of Darren McCormack. 57:15 Anthony Stokes takes a shot. Comfortable save by Alan Main. 56:48 Gavin Swankie decides to take a short corner. 56:34 Gavin Swankie takes a shot. Blocked by John Rankin. 53:49 Direct free kick taken by John Rankin. 53:49 Booking Jody Morris goes into the book for unsporting behaviour. 53:41 Jody Morris challenges Liam Miller unfairly and gives away a free kick. 50:57 Kenny Deuchar takes a shot. Save made by Graham Stack. 50:39 Anthony Stokes concedes a free kick for a foul on Murray Davidson. Graham Gartland takes the free kick. 49:55 Outswinging corner taken right-footed by Derek Riordan from the right by-line, clearance by Kenny Deuchar. 47:46 Strike comes in from Derek Riordan from the free kick, Daniel Grainger gets a block in. 47:46 Booking Steven Anderson receives a yellow card. 47:45 Unfair challenge on Derek Riordan by Steven Anderson results in a free kick. 45:39 Murray Davidson fouled by Souleymane Bamba, the ref awards a free kick. Daniel Grainger takes the direct free kick. 45:01 The referee gets the second half started. 45:00+1:27 The half-time whistle blows. 44:49 Free kick awarded for a foul by Steven Milne on Derek Riordan. Direct free kick taken by Derek Riordan. 41:14 Free kick awarded for an unfair challenge on David Wotherspoon by Graham Gartland. Free kick taken by Derek Riordan. John Rankin takes the outswinging corner, clearance made by Graham Gartland. 40:41 Gavin Swankie has an effort at goal from just inside the box that misses to the right of the goal. 39:49 Murray Davidson gives away a free kick for an unfair challenge on Kevin McBride. Indirect free kick taken by Graham Stack. 39:04 Steven Anderson produces a cross. 37:00 The free kick is delivered left-footed by John Rankin from right channel, Alan Main makes a comfortable save. 37:00 Booking Daniel Grainger is shown a yellow card. 36:55 Daniel Grainger gives away a free kick for an unfair challenge on Darren McCormack. 34:43 Gavin Swankie concedes a free kick for a foul on Ian Murray. Free kick taken by Graham Stack. 33:01 Jody Morris concedes a free kick for a foul on Liam Miller. Graham Stack takes the free kick. 31:29 Placed penalty taken by Derek Riordan saved by Alan Main. Hibernian 1-1 St Johnstone. 31:29 Graham Gartland concedes a Penalty for a foul on Liam Miller. 29:53 Steven Milne takes a shot. Graham Stack makes a save. Kenny Deuchar takes a shot. Save made by Graham Stack. Murray Davidson takes a shot. Blocked by Souleymane Bamba. 26:25 Unfair challenge on Liam Miller by David MacKay results in a free kick. Paul Hanlon takes the free kick. 25:04 The assistant referee flags for offside against Derek Riordan. Steven Anderson takes the free kick. 23:46 Steven Anderson concedes a free kick for a foul on Anthony Stokes. Derek Riordan takes the direct free kick. 21:58 Corner taken right-footed by Gavin Swankie, clearance made by David Wotherspoon. Inswinging corner taken by Gavin Swankie, save by Graham Stack. 19:42 Shot from 12 yards by Steven Milne. Brilliant save by Graham Stack. 18:53 Free kick awarded for a foul by Souleymane Bamba on Kenny Deuchar. Free kick crossed by Daniel Grainger, clearance made by Paul Hanlon. 17:37 Unfair challenge on Kenny Deuchar by John Rankin results in a free kick. The free kick is swung in left-footed by Liam Craig, clearance by David Wotherspoon. 17:02 Free kick awarded for a foul by David Wotherspoon on Murray Davidson. Alan Main restarts play with the free kick. 16:06 Derek Riordan decides to take a short corner. 15:43 Foul by Steven Anderson on Anthony Stokes, free kick awarded. Derek Riordan takes the free kick. 14:00 Murray Davidson takes a shot. Save by Graham Stack. 12:31 Ian Murray is penalised for handball and concedes a free kick. Gavin Swankie takes the free kick, Daniel Grainger takes a shot. Save by Graham Stack. 11:33 The assistant referee flags for offside against Liam Craig. Graham Stack takes the free kick. 9:13 Darren McCormack gives away a free kick for an unfair challenge on Liam Craig. Daniel Grainger takes the free kick. 6:13 Kenny Deuchar provided the assist for the goal. 6:13 GOAL - Gavin Swankie:Hibernian 1 - 1 St Johnstone Gavin Swankie scores a goal from the edge of the penalty area to the bottom left corner of the goal. Hibernian 1-1 St Johnstone. 0:40 Darren McCormack provided the assist for the goal. 0:40 GOAL - Anthony Stokes:Hibernian 1 - 0 St Johnstone A goal is scored by Anthony Stokes from inside the penalty box to the bottom right corner of the goal. Hibernian 1-0 St Johnstone. 0:00 The referee gets the game underway.